If you're looking for a landscape services provider or contractor with impeccable credentials, then choose Four Seasons Landscape Management. 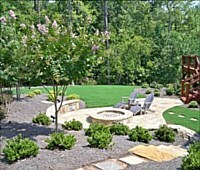 As a leading landscaping company operating in Newnan and servicing various areas all across the State of Georgia, we have skilled artisans and masons who can design and install top notch fire pits using premium grade materials sourced directly from our partner suppliers. Our company has certified professionals with memberships in respected organizations such as the National Concrete Masonry Association (NCMA) and Interlocking Concrete Pavers Institute (ICPI). As such, we have the expertise needed to create well designed fire features that are guaranteed to make heads turn and provide you and your family or guests warmth and comfort during cold weather. 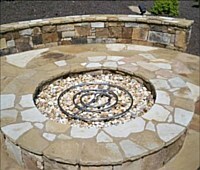 Our workers can also ensure reliable installation of every imaginable fire pit, whether it is custom-made or pre-built. Best of all, we offer competitive rates so you can have the perfect pit without busting your budget. Personalization. Custom-built fire pits offer the highest degree of personalization since you are free to choose the material, design, size, and the type of fuel to be used. Whereas, pre-made ones hardly allow for tweaks according to your specific taste. Cost. Pre-made pits are generally cheaper than custom ones, since the former is created in an assembly line manner; whereas, the latter is made of select materials like bricks and natural stones, which make them the pricier choice among the two. Speed of completion/assembly. Of course, customized fire pits take days or weeks to be completed, given that they have to be designed and built according to clients' specifications. Pre-fabricated pits, on the other hand, are essentially the plug-and-play type, which means they can be installed and enjoyed within a matter of hours. Our exclusive partnership with Belgard and Pavestone means that we have access to first-class products, particularly pre-made fire pit kits and top quality pavers and natural stones for the custom-made ones. This also means that you are paying good money for premium materials that compose your choice of fire pit. So whether a personalized fire pit excites you or you prefer a pre-built one, all you have to do is contact us and we'll take it from there. We assure you that you will be satisfied whichever your choice would be.